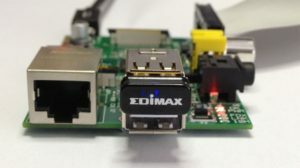 The following description how to set up an USB WiFi adapter in Raspbian is a compendium based on several tutorials (also see the sources at the end). Additions about specific characteristics of certain hardware or corrections are always welcome. But this problem can be solved easily without forcing the module to load as described in some tutorials. After restarting the RasPi ifconfig should now also list the interface wlan0. The kernel module 8192cu has a quite annoying feature: When no data is transmitted for a while the WiFi adapter will be turned off to save energy. This also means that the RasPi is not accessible any longer from outside. By using the WPA supplicant instead of a static configuration in /etc/network/interfaces the wireless network will be used automatically if it is reachable. In the same way you can also add multiple networks, which is useful when you use the RasPi at different places or with a mobile WiFi hotspot from time to time. For every network just add an additional network block with the required settings.